Jimmy Hall was born in Vinita, Oklahoma back in 1921. When he was about six years old, the family moved to Wichita, Kansas. Towards the end of his high school years, Jimmy got into the mind set that music was going to be his career choice. He pushed forward and his first radio experience was over radio station KSAL out of Salina, Kansas. After a couple of years, his talents found him returning to Wichita as a staff musician over KFBI. His reputation grew and took him next to radio station KTUL in Tulsa, Oklahoma where he worked with the original Alabama Boys. He stayed there for about nine months. His next stop on his musical journey was a return trip to Wichita. This time he was working over KFN and stayed there for a couple of years. In 1943, he joined the Army to serve his countryduring World War II, serving in the 63rd Infantry Division in England, France, Belgium and Germany. He was discharged after three years of service. 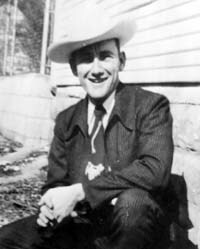 In February of 1947, he took his fiddling talents and vocals back to Tulsa where he worked with Leon McAuliffe's band over station KVOO. His first fan club newsletter written by President LaRayne McCann, (who lived in Wisconsin back then) noted that he kept busy with his radio shows and personal appearances. Jimmy could also do a bit of songwriting. He penned a well known tune called "T-U-L-S-A Straight Ahead" that was recorded by the popular western swing bands of that era. He noted in his fan club newsletter that he had written one of Leon's Columbia releases, "No One For Me". A 1948 article notes that he co-wrote a tune called "Search My Heart" with Leon McAuliffe. The author of the article notes that the tune gave Jimmy a chance to showcae his vocal talents, "...knack for putting simple feeling in his phrasing, and is a great favorite on all their radio shows." A 1953 article featuring Leon and his band notes that Jimmy also did the vocals on "Sugar and Salt". Fan club newsletters of that era were interesting. They'd include a note or two from their featured artist, news of the artist's career, where to hear him, or the latest recordings. You'd also sometimes see notes from other personalities - perhaps a common courtesy to exchange pleasantries by artists and their fan clubs. They would also include write-ups on other artists of the day as well. In fact, Jimmy's first issue ("Hall Highlights") did include a note from Norma Barthel, the long time head of Ernest Tubb's Fan Club and publisher of their "Melody Trails" publication. The fans would also include tributes to their favorite star. In the issue we have, we're guessing it was published in the 1951 to 1953 time frame. It's dated Sep-Oct-Nov, but no year is given. One of its members, Monna Massey wrote a tribute to Jimmy. That wins him praise throughout the land? Who has that smile for one and all? Why, it's KVOO's own Jimmy Hall! That Jimmy is a STAR in all reality. Remember, we're with you, Jimmy Hall.